The wedding day is not a small occasion, and people look to purchase a ring that would be suitable for the occasion and would not fail to bring a smile on the face of their significant other. Being economical is good, but it should also be ensured that one does not adopt a miserly approach to the task. Adequate research regarding the options you have can prove to be beneficial. If you want information regarding the average cost of a wedding ring, the simplest answer is that it depends on you and what you are looking for. Various factors influence the price of the ring, some of which we are going to discuss now. One good thing about wedding rings is that there is no dearth of options. You will find plenty of options to choose from, ensuring that you will find something that not only is according to your taste but falls within your budget as well. Some common questions tend to swarm everyone’s minds when they think of purchasing a wedding ring. What is the price difference between a wedding ring for men and women and do both rings cost the same? How much do different elements influence the price of the wedding rings? Should the wedding ring be similar to the engagement ring? These are some questions that spring to mind. It is seen that an average of $1,417 is spent on a wedding ring for a woman, while a wedding ring for men costs around $558. Thus, most couples will spend nearly $2,000 on wedding rings. Different factors influence this price. The metal that the wedding ring is constructed from is important. A ring manufactured using plain gold would be less expensive as compared to one that is made using platinum. Platinum rings are more expensive as compared to gold ones because platinum is denser, so more is required to make a ring. Furthermore, platinum rings usually consist of 95% pure platinum, while 14K gold only has 58.5% gold. Platinum rings are available for anywhere between $1,300 and $3,000. The cost of the ring will further increase if it contains diamond embellishments. One thing that you should keep in mind is that you will get what you pay for. In the recent years, a rise in popularity has been witnessed in the tungsten wedding rings for men. These are considerably cheaper. However, the drawback they have is that no adjustments to size can be made and it cannot be repaired. The amount of metal in the ring is directly related to the cost of the ring. The higher the width of the ring, the more it’s going to cost. If you add diamonds to your wedding ring, the cost is going to increase. It is seen that these days, most brides prefer to have diamonds in their wedding rings. The price of the ring would depend on whether the ring is the classic 5-stone one or the eternity ring which features diamonds all the way around. Other influencing factors include the karat weight, quality and amount of diamonds, among others. 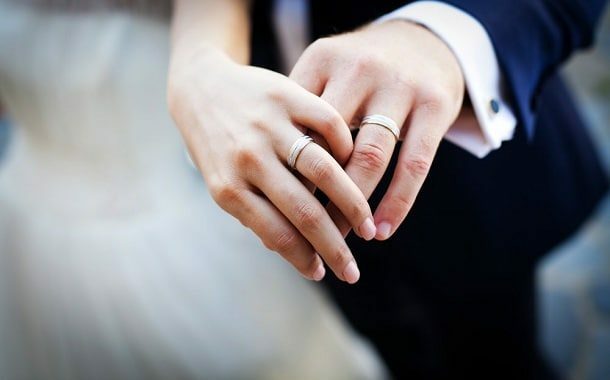 If you want to match your wedding ring to your engagement ring, your choices would be somewhat limited, and the price of the ring would be in accordance to that. The budget might increase if you get a custom design of ring made to match your engagement ring. Another factor is whether you want your ring engraved or not. Some places engrave rings free of cost while others will charge you for the work. At the end of the day, the amount that a wedding ring would cost depends on you entirely. You can seek input from others and get information about the average budget most people set for this purpose, but at the end of the day, it would come down to how much you are willing to spend. The kind of person your future wife is would also influence your decision. Many women do not like the idea of putting in too much money into a wedding ring, while others prefer a ring that breaks all barriers. Therefore, while setting a budget for the wedding ring, you should ensure that the decision is personal and has been taken after paying heed to all the relevant factors. How Much Does an RV Cost? How Much Does Travel Insurance Cost?